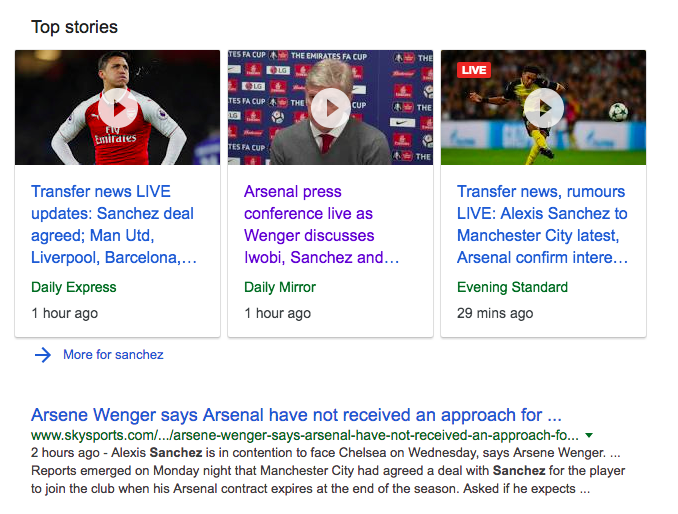 The Express appears to have a scoop when you search for Sanchez news on Google News. No other news source has the story that a Sanchez deal has been “agreed”. Indeed, Sky Sports says City haven’t even bid for the Chilean. Stuart Ballard has the scoop! But to save you clicking, we’ll not pick out the words relevant to Sanchez’s transfer to City. 10.00: Arsene Wenger has claimed Arsenal have received no offers for Alexis Sanchez and he fully expects him to stay until the end of the season . When asked if the Gunners had received any offers, he replied: “No and I expect nothing. Come on, Wenger, keep up with things. Read the Express. The deal has been “agreed”. But what’s this? Reading on we find no word on the agreed deal. 05:30: Manchester City could complete a deal to sign Alexis Sanchez this week after opening talks over a £30million deal. Could? What happened to “agreed”? Express Sport understands the Chile international has been told City will be making a bid for him in the coming days. What about what readers understand by the phrase “Transfer News: Sanchez Dal Agreed”? But Ballard has nm’t finished. Let’s not be hasty. What else? And with Sanchez constantly linked with a move to Manchester City, Arsenal are prepared to enter the race once again to sign Lemar. Total balls, then. It might even be fake news.